Clays are classified as either primary or secondary depending on their geological histories. Primary clay is usually found in the same place as the feldspar from which it originated, while secondary clays have been transported by wind, water or both from their places of formation. Primary clay is relatively rare and has particular properties with which potters must work. In contrast, secondary clays are far more abundant and tend to be easier to form and fire. Primary clay is formed when the weathering processes of wind and water change the composition of feldspar. Feldspar, in turn, is the mineral name for a group of compounds formed from chemically bonded silica, alumina and one of the following: potassium, sodium or lithium. When water replaces the metals in feldspar, primary clay is formed. Because the weathering processes that move primary clay often introduce other elements, minerals and particles ("contaminants"), primary clay is rarely found away from its place of origin. When these "contaminants" mix with primary clay, the resulting product is a secondary clay. Secondary clays are quite abundant; primary clay is not. The most notable contaminant that does not appear in primary clay, but is present in virtually every secondary clay, is iron. Primary clay also remains unsorted by particle size, unlike the others. Primary clay is excessively difficult to shape in its pure form. With clay, plasticity--or a material's malleability plus its ability to adhere to itself--depends on the size of the particles, the shape of the particles and the water film formed between the particles when they are wet. Kaolin has very large particles, so its plasticity is quite low. Because of these large particles, however, it also shrinks less. This means if a potter can successfully form and stabilize a shape, it has less chance of cracking when dried and fired in the proper environments, versus smaller particle clays. Potters use a specialized means of gauging firing, or kiln, temperatures called "cones." Primary clay, or kaolin, fires at high temperatures--typically in the same temperature range as stoneware--between six and 12 cones. In all stages, however, primary clay is much more fragile than stoneware. Brittle and dense, it chips and breaks apart easily. Hours of a potter's work with kaolin can be destroyed with a jostle of an unfired piece. 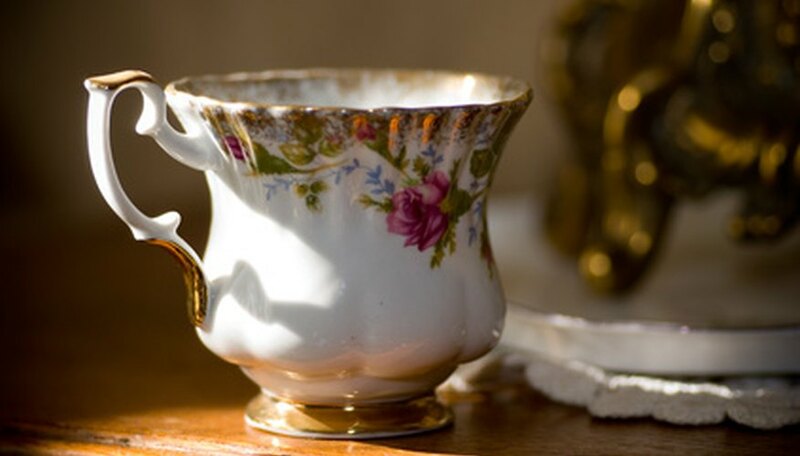 Known for its pure white, almost translucent color, rarity and difficulty to craft, primary clay (kaolin) is highly prized for making porcelain and fine china dishware. It is also mixed with other, more plastic clays to produce more malleable but still beautifully white pottery pieces. Elizabeth Jennings began publishing creative works in 1988 and has been a professional editor and writer since 2002. She holds a dual Bachelor of Arts in anthropology and philosophy. Who Invented the Potter's Wheel?